Menulog delivers for The Fish & Burger Cafe so you'll be able to track your courier on a map. 3 x Fish Bites Chips, 1 x Tomato Sauce and 1 x Pop Top Drink. 6 x Calamari Rings, 1 x Chips, 1 x Lemon and 1 x Tartare. 3 x Fish Bites, 1 x Potato Cake, 1 x Dim Sim, 1 x Calamari Ring, 1 x Chips, 1 x Lemon and 1 x Tartare. 6 x Chicken Nuggets, 1 x Chips and 1 x Tomato Sauce. 1 x Grilled Fish, 1 x Rice or Chips and 1 x Salad. 2 x Fish, 4 x Fish Bites, 4 x Potato Cakes, 4 x Dim Sims, 4 x Calamari Rings, 1 x Large Chips, 1 x Lemon and 1 x Tartare. 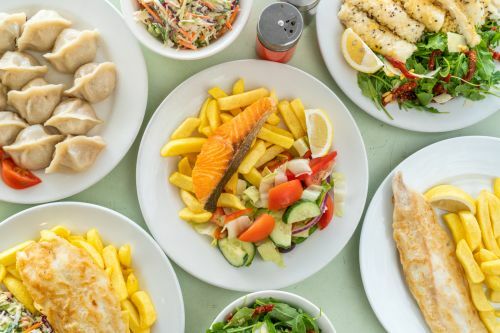 3 x Fish Bites, 1 x Prawn Cutlet, 1 x Scallop, 1 x Calamari Ring, 1 x Seafood Stick, 1 x Chips, 1 x Lemon and 1 x Tartare. 1 x Burger, 1 x Chips and 1 x 375ml Can of Drink. 1 x Calamari, 1 x Rice or Chips and 1 x Salad. 1 x Atlantic Salmon Grilled with peri peri spices, 1 x Rice or Wedges and 1 x Salad. Vegetable patty, lettuce, tomato and tomato sauce. Fish fillet, lettuce and tartare sauce. Marinated chicken breast, lettuce, avocado, bacon, cheese and cajun mayo. Lettuce, tomato, cheese, egg, bacon, onion and tomato sauce. Scotch fillet with lettuce, tomato, cheese, egg, bacon, onion and tomato sauce. Lamb fillets, lettuce, tomato, onion and tzatziki wrapped in a pita bread. Marinated chicken breast, lettuce, tomato, onion and tzatziki wrapped in a pita bread. With carrot, mushroom, bean curd and spring onion.